With enriched market experience, we have been able to offer a wide spectrum of Lavender Air Freshener Spray. Multi Action Air Freshener & Surface Care : tackles the root cause of bad smell : Kills the germs ( bacteria & fungus ) floating in the Air & surface ( floor, ceiling, walls ). High impact, high quality fragrances that are formulated to control odours effectively and efficiently. Each refill delivers 3, 000 metered sprays. 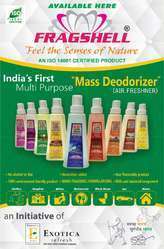 Our enterprise is dedicatedly engaged in providing Air Freshener in the market.